This little piggy, stayed at home. This little piggy, had none. This little piggy, cried “Wee Wee Wee” all the way home. I always thought that the little piggy who went to the market was the luckiest of the 5 as he got to go to the market! The place of sights and smells! The one who ate roast beef, always struck me as a psychopath (and it was a bit disturbing). As a brilliant segue, the Boy and I (both born in the year of the Pig) love visiting markets. 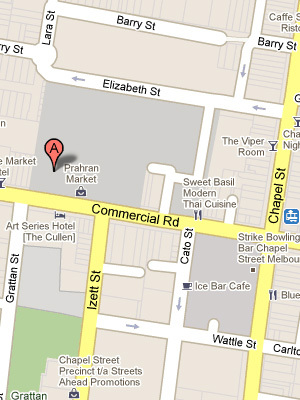 One of our favourite markets is the Prahran Market. Now I know it’s the higher end market, with much fancier prices, but the quality of the produce there always speaks for itself. How many other markets are there, that have a Mushroom seller with an Order of Australia? One of my favourite pit stops whilst shopping at Prahran Market is the famous Market Lane Coffee. They have a simple mandate to their approach: Source, Roast, and Brew. 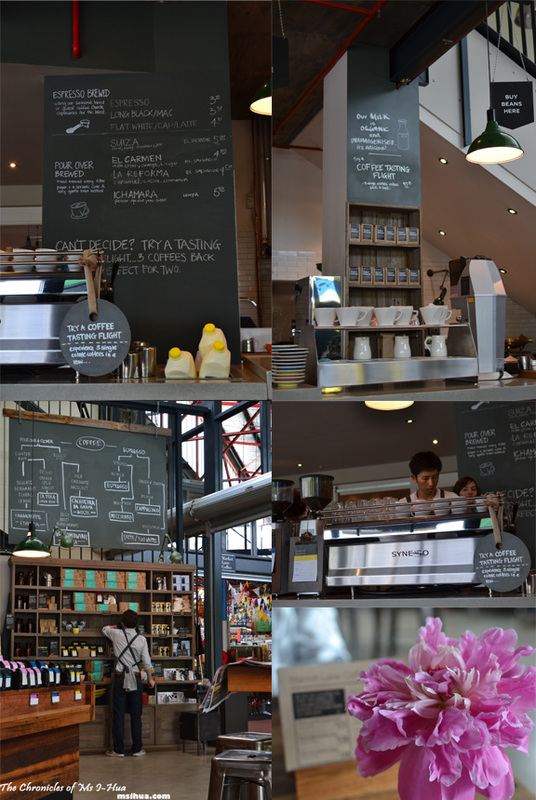 When I last paid them a visit, I went a bit mad in trying to choose a blend (or three) or single-origin coffee to try. You can also subscribe to their Coffee Club Membership for freshly roasted coffee beans (250 grams) sent to your doorstep (delivery within Australia) every fortnight. Prices at the moment are: 3 month subscription (6 deliveries) for $125, 6 month subscription (12 deliveries) for $250 or 12 month subscription (25 deliveries) for $480. 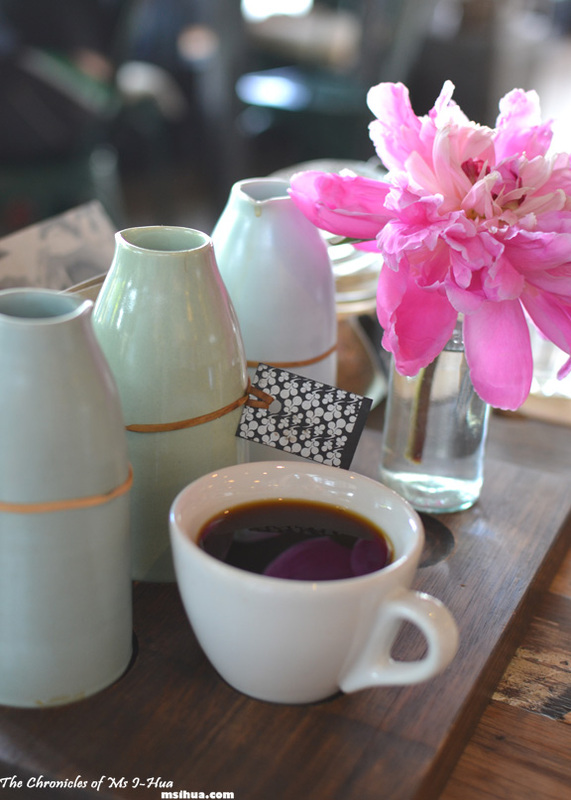 El Carmen Latte – El Salvador ($4.80) with notes of milk chocolate, orange, and brown sugar. It was, what I would described as coffee fluffy floss. It was light and creamy. Did I mention that they use Schultz milk? It’s organic, unhomogenised, and taste like real milk! MMmm… It really makes all the difference. As mentioned, I had the Coffee Tasting Flight ($12.00) – Where one (or a few) get to experience 3 single estate coffees in a row. “Pour Over” Coffees for the day were: Ichamara, La Reforma and Finca Suiza. First Pour Over: Ichamara (Kenya). Peach, Apricot Jam, Butter. Second Pour Over: La Reforma (El Salvador). Caramel, Cocoa, Cinnamon. Third Pour Over: Finca Suiza (El Salvador). Honey, Hot Strawberry Jam. I’m not going to pretend that my palate is that refined that I could distinguish each of the flavours that were meant to be in existence. I can say though, that my favourite was the Ichamara as it was the sweetest of them all. Notes are provided for you as you sip on your brew, and it makes for a fun, “Did you know?” session. 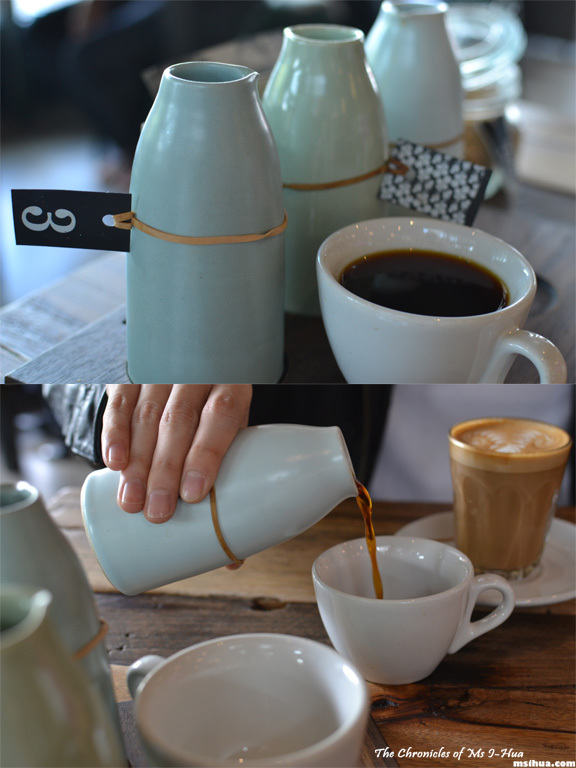 Market Lane Coffee also runs coffee classes for those interested in learning more about coffee brewing and roasting. Brew Classes – Learn the basics of several different brewing methods. Classes are $60 at time of publish. Introduction to Sample Roasting – Learn the art of roasting coffee. Classes are $250 at time of publish. Check their website for more information regarding bookings and dates. tell me about the expensive produce at the prahran market, especially after shopping at footscray. that being said, we have been very happy with what we bought there; fresh tuna, the dry aged beef was awesome, the free range chick. a pity our duck seemed a bit off, but thats bcos i left it in the fridge for a couple of days. i remember the flight of coffee when i visited over a year ago, cant wait to drop back for more marketing and drinking coffee. That was our first impressions as well! Oh well 🙂 Good food comes with a price tag! Did you get drunk after that? Coffee flight, that is one option I still can’t take at the moment. But I laughed at your description “coffee fluffy floss”. So cute! 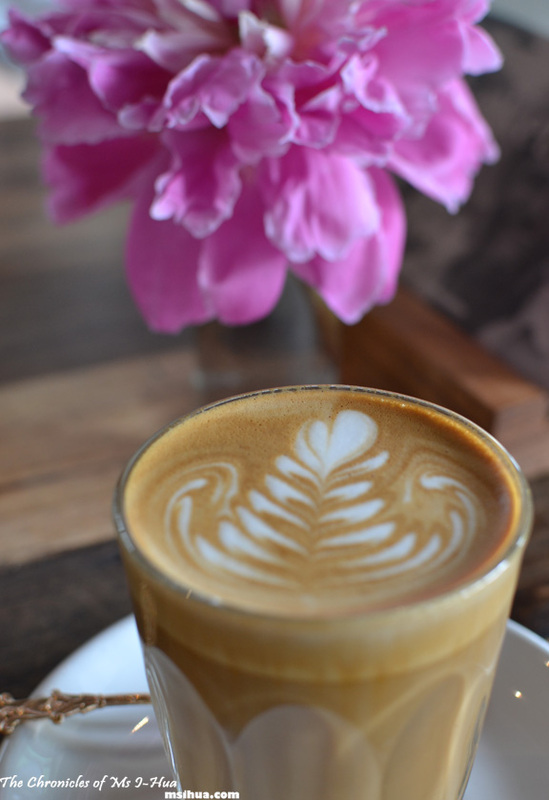 Beautiful photo of the coffee with the flower. I never knew the mushroom seller at Prahran market had an order or Australia. You learn a new thing every day I guess…..
As one Melburnian who shamefully admits my attitude to coffee is similar to my attitude to art – “I don’t know much, but I know what I like” – it’s a delight to see Market Lane make a premium offering so simple to navigate. It is. Us simple folks love it! 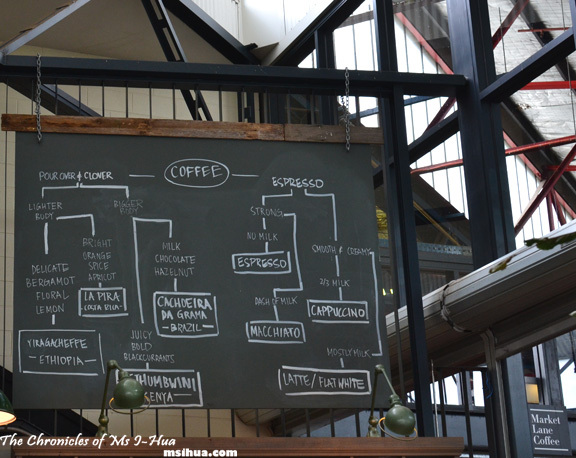 The chalk board showing the different coffees is a great idea:) When I was new to coffee I would become confused about what I wanted to order. A board like the one you feature here avoids confusion! There’s a sign board right at the back of Seven Seeds as well (not as detailed as this) but with the history! I love fun facts! Wow I didn’t know the mushroom seller had an Order of Australia. Maybe I can get one for eating lots of food?